The Dutch crew Massive Assault promised the appetizing combination of Floridian and Swedish death metal, with a dose of crustiness and punky attitude mixed in, and they very much deliver in this vein. The band, in large part, relies on their domineering bottom end as a foundation of their sound. The drums pound it out pretty good as well, driving in stakes on Finished Sympathy, but it is the bass lines of Jos Kracht which are the centerpiece on Death Strike. 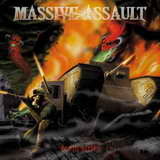 From opening bass licks on the aforementioned Finished Sympathy to machine gun tight catchiness of Operation Anthropoid and Pride, without bass guitar the music of Massive Assault does not go forward. Bass lines are the engine of Massive Assault vehicle, in a way similar to Manowar’s Joey DeMaio, constantly audible, pulsing and propelling the music throughout. Massive Assault’s guitars are tuned a little bit higher in the mix and grind/slice away, filling the spaces in between bass framework, providing flashes of interesting fret skills on Cycle of Violence or break down the steadiness of Pride with an alarmist air raid siren solo, but they are still playing a second fiddle to a bossy bass. Death Strike mostly operates on a faster plane, taking it to skazzy punky D-beat heights on Cycle of Violence and Aggressive Depression, although the band is not averse to driving mid-pace swells through mosh pit on Finished Sympathy. At times, when they decide to explore a slower, more doomy, end of the spectrum (Dismal Life, Turning Tides) they appear no less devastating. The music on Death Strike is very much a reflection of the cover art, a tank plowing and trampling over all things living, only periodically a faster gear runs into a stalemate with a slower more methodical motion. Where Massive Assault fails is their vocal department. LG Petrov would have turned this music into a super memorable experience. Any bottom barrel growler would have at least tried to wrestle the laurels away from the authoritarian bass line. Carl-Christian is set way low in the mix to begin with, and he lacks any power whatsoever to make a splash. This is death metal, and we are not supposed to decipher every word of lyrics, but the voice is completely drowned out. The tracks like chaotic turned ravaging chord explosion Operation Anthropoid and dirgy-to-punky Turning Tides would have been a stage for the vocals to emerge, but they are desperately lost behind the music wall. As my mood went, Death Strike was just a right pill to clench that fist and keep on going. Not an album to get all contemplative about, it is what it is – a 37 min barrage of well executed death metal touching on many directions of the genre.